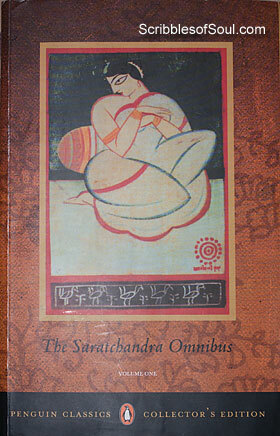 The third novel in The Sarat Chandra Omnibus ,Parineeta is somewhat similar to Devdas. It can be loosely termed as another childhood romance, where protagonists, Shekhar and Lalita are neighbors, falling in love with each other by virtue of familiarity. Their liaison is objected by Hero’s father, and much drama takes place, before they can finally be together. So, in a way storyline is quite similar to Devdas, but thankfully, it ends in happiness and union, as opposed to longing and separation in the previous novel. Shekhar is a well educated man, belonging to a rich family, while Lalita is an orphan, living with her mama, Gurucharan, who is a humble clerk and a man of modest intelligence. Apparently, he is a man of limited means and ample responsibilities. He has to take a loan from Shekhar’s father to perform the wedding of his eldest daughter. And, though he seriously considers Shekhar’s father as a loyal friend, in reality he is tricked to mortgage his house, the sole property, he can ever boast of. As the time passes by, it becomes clear that Shekhar is madly in love with Lalita, though he initially misunderstands his own feelings. It takes the jolt of a charmer Girin, to realize that Lalita is of paramount importance in his life. In midst of romantic notions, the author brings a twist by sending the Hero away, while the heroine is left alone to salvage her mama from the loan sharks. Will Lalita be able to resist the temptation of Girin, as a possible saviour and remain true to fickle minded Shekhar forms the basic premise of this 54 pages novel. The story is entirely based in Kolkata, as opposed to Srikanta, Devdas and Palli Samaj, where village life formed a major chunk of the narrative. I also found the clash of orthodox Brahmanical approach and modern Brahmo attitude, quite impressive, almost as done by Tagore in Gora. The novel is translated by Malobika Chaudhury and too short to be termed as a proper novel. But, nevertheless, the scope in the story is endless, and probably that’s why Pradip Sarkar could make such an entertaining movie of the same name, starring Vidya Balan. And, it is one of those rarest occasions, when I liked a movie much better than the original book, the first instance was Godfather, and the next one is of course Parineeta. In the novel, I found the portrayal of a twelve year old girl as a married woman, who fully understands the question of loyalty to the man, with whom she has exchanged only garlands, a bit unconvincing. To me, Lalita appeared too young to don the mettle of an espoused woman. I don’t know if Doll wedding of yesteryear was actually responsible to cultivate virtues of married women in girls at such an early age, or was the time different, and such maturity was expected of womenfolk, and hence, portrayed by Sarat. But, to my twenty first century heart, Vidya Balan came across as a better fitted Lalita. Secondly, I could not understand the importance of first scene, where the fifth daughter of Gurucharan is born, as throughout the novel, only Kalli was given any role. Perhaps, the scene was just meant as a scathing remark on helplessness of a poor father, burdened with five girls! However, still the novel is good and has ample score for expansion. It is one of those books, where written words are few, but the image created is huge, left for interpretation by the readers alone. And, on this point, it really scores well.